Hello and Thank You for visiting our latest Classic Car up for auction by The Motor Masters! 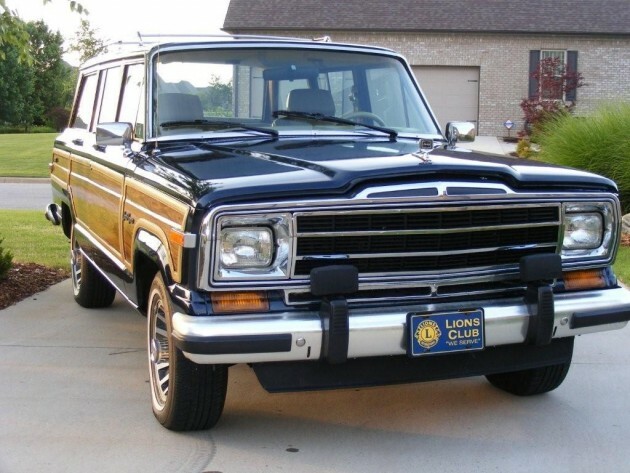 You are bidding on a 1991 Jeep Grand Wagoneer that is a PREVIOUS MOTOR MASTERS PROFESSIONAL RESTORATION!! Our Customer bought this from us in 2010. It is the the most popular and demanded of color combinations…..BLUE WITH TAN INTERIOR. Since then, it has ALWAYS BEEN GARAGED KEPT and ONLY 4000 MILES has been driven since the Wagoneer was purchased from us!! This is a Consignment Vehicle as our Customer is moving and no room to Garage so we need to find a new home for this Beautiful Classic Wagoneer!!!! BRAND NEW PAINT JOB(3 Coats of Base and 3 Coats of Clear. It was sanded down to the bear metal). OTHER NEW ITEMS: 4 Whitewall Tires, Fuel Pump, Belts, Fan Clutch, Spark Plugs & Wires, Air Filter, Oil & Filter Plus Fluids, Front Steering Shock, Rear Brakes & Cylinders, Headliner & Sun Visors, Battery, Tailgate Switch, and Woodgrain Vinyl. All Differentials & Transfer Case had been serviced. 4WD works and Shifts Smoothly. All Windows work, including Tailgate Window with Switch and Outside with Key. Electrical Door Locks, Seats, Overhead Console, Factory Fog Lights, and Cruise Control Work. Has Factory AM/FM Radio, however it goes in and out when on. AC was converted to R134 and blows ICE COLD! A new Radiator has been replaced, along with new valves gaskets. Most importantly….NO RUST ANYWHERE!!! VISIT MY OTHER ITEMS UP FOR SALE!!! BUY WITH CONFIDENCE….I HAVE A 100% FEEDBACK RATING FROM ALL MY CUSTOMERS!!! !